Given these two parallel developments, it comes as no surprise that Netgear will incorporate a Wi-Fi 6 (802.11ax) platform into the next-generation Orbi. The product will continue to use Netgear's patented Fastlane3 technology (with a dedicated 4×4 802.11ax backhaul, in addition to 5 GHz and 2.4 GHz channels for use by clients). 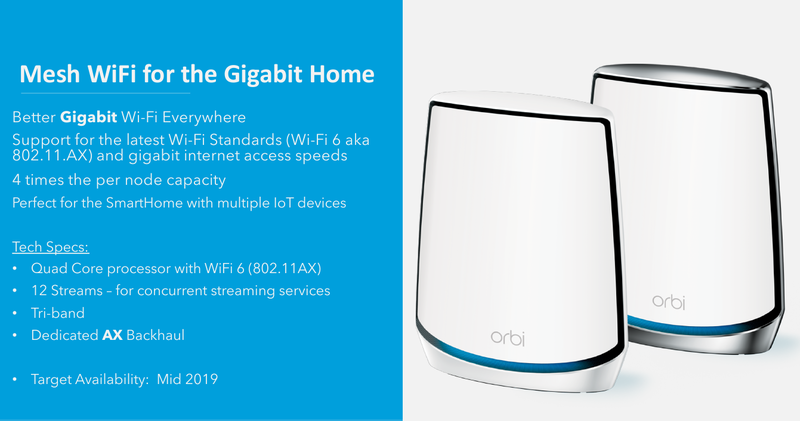 The Wi-Fi 6 backhaul enables true gigabit wireless links between the Orbi nodes. Netgear also announced that the Orbi products will continue to use a Qualcomm platform (in fact, the early specifications seem to indicate that the RAX120 platform is being used with the addition of another 802.11ax radio).